This document was compiled from Official Union Pacific Dining Car & Hotel Department Dining Car Service Manuals that were assigned to each dining car (and never to be removed from the car). Date first edition was produced is not given nor author. It was a living breathing document in that changes to recipes were being changed from time to time. 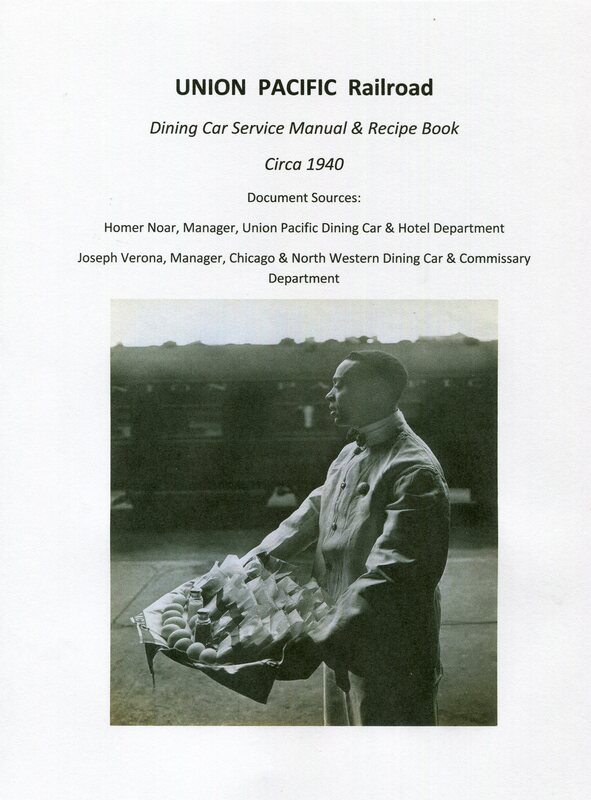 This compilation was done from two original documents, the first from Mr. Joseph Verona of the C&NW Dining Car Department and another from Mr. Homer Noar of the UP Dining Car & Hotel Department. While the document had Union Pacific authorship, this document was utilized by both the UP and C&NW for continuity of service.The document was used jointly up until the C&NW lost the operating partnership of passenger trains from Council Bluffs, IA to Chicago and the Milwaukee Road take over of that route. With the Milwaukee Road takeover, the UP went to the more familiar black cover binder books which were less complex and detailed.